This week, my post at PopMatters comes to you courtesy of Subway. 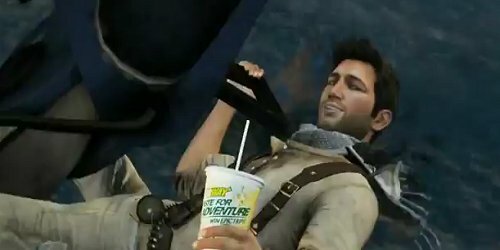 That's a bit of an exaggeration: Subway didn't sponsor my post, but it couldn't have happened without the Subway Uncharted 3 promotion. Jorge and I talked about the (unprecedented?) ad campaign a few weeks ago. Ultimately, my love of multiplayer and sandwiches surmounted my reservations about creeping corporatism and I went down to Subway to grab a code. The post is basically a debriefing. As I've said before, I think Uncharted 3's multiplayer is very good. Therefore, I'm glad Sony seems to be pushing it. Unfortunately, it's popularity and the early access may ultimately be detrimental to its accessibility, as people have already become ridiculously good at the game. By the time the game is released, many players will be experts at navigating the maps and will have unlocked gear superior to what is available for newcomers. I think the promotion is more interesting on a philosophical level, as it raises questions about what we should expect from video games and their characters. What does it mean when fictional characters become spokespeople for non-fictional products? How does selling parts specific parts of a game impact the entire package? Will this become a trend? As I say in the post, I'm certain people would pay extra money to get early access to the Modern Warfare 3 multiplayer. I doubt you'd even have to offer them a sandwich. Finally: I'm interested in hearing from anyone who has unlocked and chosen to wear the Subway-themed gear in the Uncharted 3. In a word: Why? Do you view it as a mark of your skill? Do you like the design? Are you wearing it ironically? Do you consider it an advertisement for Subway? I'm genuinely interested. Ultimately, I'm happy that I had another shot at Uncharted 3's multiplayer and that I was able to do some first hand research in a trend that has both design and artistic implications for the medium. However, my experiences have made me reluctant to embrace similar promotions in the future.